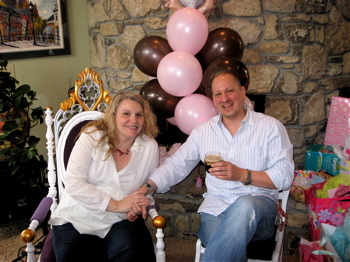 Sitting in the chairs of honor at our baby shower. A few weeks back there was a party planned of special significance on a Sunday in Louisville. The clans had gathered for a baby shower, which is not my usual speed, but what put the real twist on this shindig was my girlfriend Maia and I were the guests of honor. Yes, a baby Llama is on the way! I know what you’re thinking: Pedro + babies does not compute. Trust me, I concur, this is a frightening concept. A few months ago, the only thing I was looking after was my dead cat’s ashes. I have a healthy sense of mortality, and I am one scared soon-to-be-daddy, but it’s all good. I’m not saying it’s not a shock, but a positive one. We held off telling anyone for a while due to Maia’s age, until she was further along, and we knew it was a viable pregnancy. That was a stressful time for us. The odds are considerably higher for chromosome disorders and other birth abnormalities in pregnancies by woman over 40, so we wanted to pursue early warning genetic screening to ensure everything was proceeding normally, and to give us some comfort as we moved forward with this life changing event. 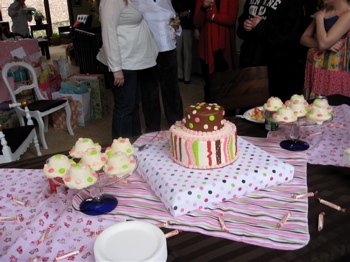 A festive table awaited the cake cutting. My hat is off to Maia. She has done amazingly well handling this unexpected surprise and coping with the changes it has brought. As my friend Matt is fond of saying, we’d have run out of people long ago if it were up to men to bear children – guys aren’t tough enough to put up with being pregnant. Thus far mom and baby Peanut are healthy and normal. Maia’s boys, Gabriel, 9, and Jacy, 7, are psyched about having a baby sister. They’re thought is a sister is like a kitten but even better. We’ll see how they react to the whole diaper thing. I remain stunned and amazed. I’m excited by the prospects, scared of what I might do wrong, but coping. Nicole and Maia share a laugh about impending motherhood. Maia’s done this twice before, and is a gifted mother. She believes I’ll be a fine dad. Supposedly instincts take over. Those instincts certainly haven’t kept many of my house plants alive, but I’m listening and praying. 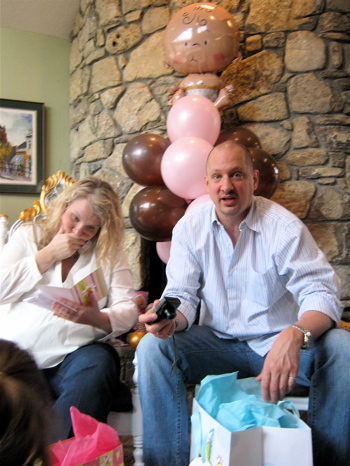 So why not put my fears on full display at a baby shower. 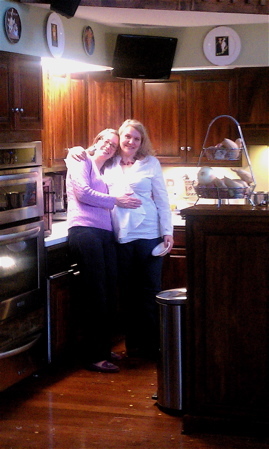 Maia’s big sister, Gillian, and her husband, Dennis, were kind enough to host the event. Thankfully this was more house party than straight baby shower. Still, I imagine some came with the possible expectation that I might have an episode in the middle of it all, or at the very least get to see me holding up tiny dresses while sipping cocktails. It makes for good theater regardless. In honor of this lovely and absolutely “unique” occasion I cooked up a huge pot of duck, andouille and chicken gumbo. It was Mardi Gras season and I wanted to lend the event a little New Orleans flavor. A lot of love goes into making gumbo – it seemed like a fitting dish to share with this gathering of friends and family. The weekend before the shower, I had to be in Lexington to shop at Once Upon A Child, a baby consignment store, which happened to be in the same shopping center as Critchfield’s. This was an added bonus because they had ducks and andouille sausage, neither of which is easy to find, in addition to a great price on fryer chickens, so I grabbed two. 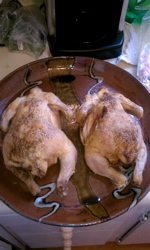 The shower was the following Sunday, so I started the gumbo process Friday after work by baking both the chickens. That next morning I popped on some cooking music, Fallout from the Phil Zone by the Grateful Dead, ground some Tanzanian coffee beans and brewed a pot, then pulled the chickens out of the fridge. I rendered all the meat from the birds, chopped it up and set it to the side. Now I’m ready to make the stock. In gumbo particularly, making fresh stock is key. It’s more time consuming than difficult. I like to allow a day in between making stock and putting it to use, so it can cook down, cool and steep. The flavor in comparison to pre-packaged stock isn’t close, and if you make extra it can be frozen for later use. Stock ingredients all chopped up. 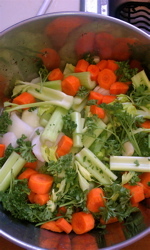 2 pounds chicken bones; 6 quarts water; 1 cup peeled, chopped carrot; 1/2 cup chopped onion; 1/2 cup chopped celery, with leaves; 1/2 cup chopped fresh parsley; pinch of fresh thyme; 1 bay leaf; salt and ground white pepper. Place the chicken bones into a 400 degree oven to be browned for 20 minutes; bring the pot to a boil, add the bones and reduce heat to medium, then simmer for an hour or until the liquid is reduced by half; remove from the heat and let cool, then refrigerate for 5 hours or overnight, this makes it easy to skim any excess fat from the surface, then strain the liquid and discard the remains. I cooked up the duck and andouille sausage as the stock simmered, and hacked it up. The skin on the duck was amazingly thick. I had to use kitchen shears to remove it. This little duck was so tasty. 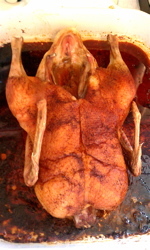 While duck may be oily, it’s also moist, rich and densely flavored. I made appetizers for Maia and the boys by taking some of the duck meat and placing it on lightly baked French bread, topped with debris gravy. What a decadent appetizer. That was it for Saturday. I was up early Sunday to get the gumbo assembled. I chose Jimi Hendrix, Live at Fillmore East, as my cooking tunes for the day. 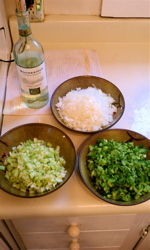 First thing to do was chop up the trinity of onion, celery and green pepper, three cups each. I find fresh garlic to be equally indispensable. Now as the Louisiana saying goes when making gumbo, “first you make a roux.” This is a thickening agent, and provides aesthetic color to the dish. It seems simple enough, equal parts vegetable oil to flour, but without constant attention it can burn quickly. The trinity of celery, onion and green pepper. I was making a batch and a half of gumbo, so I did 1 1/2 cups each of oil to flour. Get a cast iron skillet preferably and some hazmat sleeves for your arms. This gets very hot and pops and spits occasionally. Heat the oil till it’s nearly smoking, then sift in the flour, stirring constantly. I wanted a dark roux for gumbo, chocolate brown, so once all the flour was added I needed to cook it on medium low heat for around 15 minutes or till I get the desired color. Stir and keep stirring so it doesn’t settle on the bottom and burn. Once the roux was ready I set it aside. Remember it will keep cooking in the cast iron for a bit after being removed from the heat, so account for that. I placed 12 cups of stock into a 8 1/2 quart stock pot to warm, sautéed the trinity before adding to the stock, measured out salt, black pepper, white pepper, cayenne pepper, thyme, basil, homemade Cajun seasoning, parsley, Frank’s hot sauce and pitched all that into the pot with a couple bay leaves. The chicken, duck and andouille sausage were next, followed by the okra, which helps thicken. I got this boiling and hit it with 2 cups of sherry, which partially evaporated into the steam and put off a wonderful aroma. 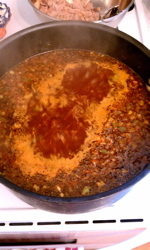 I brought the gumbo down to a simmer and began spooning in the roux. With such a high flour content I added this a tablespoon at a time to judge the impact on the flavor, color and density. I used a little over a cup total, due to my overindulgence on the meats. 1 (5-pound) chicken; 2 teaspoons Creole seasoning; 2 1/2 cups all-purpose flour; 1 cup vegetable oil; 2 cups chopped onion; 1 1/2 cups chopped celery; 2 cups chopped green bell pepper; 6 cups chicken stock; 1 1/2 teaspoons minced garlic; 1 pound andouille sausage chopped; salt and pepper; 4 cups cooked white rice. Once this cooled sufficiently I packaged it up and loaded the precious cargo in my ride. I brought along a gumbo triage kit, in case flavor-correction was necessary, and some parsley and green onions to use as garnish. Nothing like cooking for 50 people to give you the shakes. I was psyched to see some old friends, like Matt, Dennis, Nicole and Eric – people I’ve known for 30-plus years. 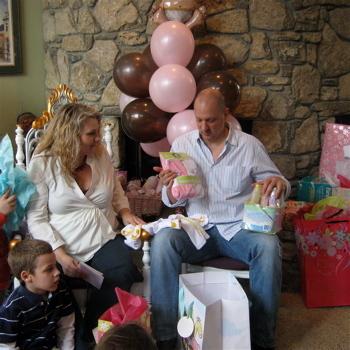 My family and Maia’s; just odd that it was our baby shower that brought us all together. 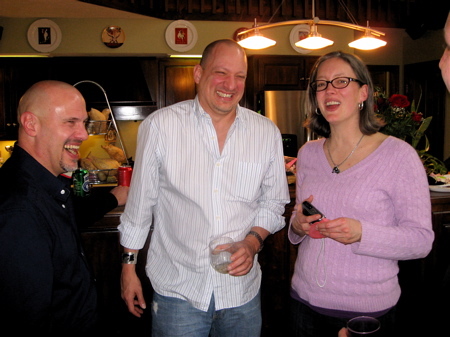 Matt, The Llama (father-to-be), and Nicole share a generous laugh, most likely at my expense. 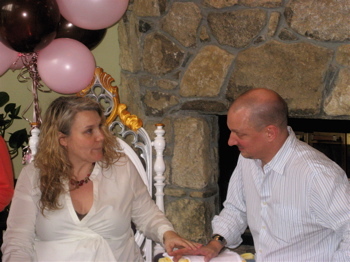 Considering my usual lifestyle, which was predicated on me having the freedom to do most whatever I pleased, the news of Maia and I having a baby was a tad startling to many, including me. I haven’t lived around my friends and family in Kentucky for 25-years, so they usually only see me in a manic state, when I’ve come in for a week at Thanksgiving or Christmas, and I’m running around with my hair on fire trying to squeeze in visits with everyone. That creates an interesting perception of me I’m sure, and over time forms an even crazier mosaic about what my life must be like all the time. Factor in on top of that, since 2007, I’ve done little else but cover and write about music, music festivals, travel, food, restaurants, reality television, and club life. I’ve lived a vampire existence, and only recently come out of the dark to be amongst the day-walkers. Maia offers aid and comfort. This is a good thing, and Maia helped me see that light, for which I am eternally grateful. What this means is, I’m taking my enthusiasm and discipline and focusing it in a new directions. Having a baby wasn’t something I thought was going to happen for me, but now that it is, I’m looking forward to embracing this new adventure and making it my own. Maia looks on in my bewilderment. I see the humor in all this as well. I’d be thinking the same thing if I was looking in on my circumstances. But Maia and I were blessed with this opportunity and I have every intention of making this little girl’s life a loving success. 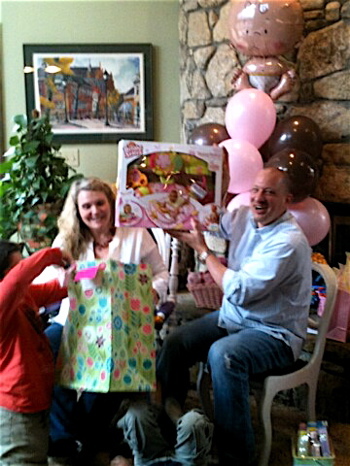 One way to show that and kick things off officially was to have a baby shower. The friends and family who helped arrange this are the people we’re closest with and definitely who I’d choose to have around us to share in such a moment – plus they’re all veterans of parenthood. I’ll take all the advice I can get. Thankfully we weren’t going to be playing any goofy games or dishing out joke gifts. It was a festive atmosphere. Beer, wine and bourbon were all about. I got the gumbo back up to heat and cooked the rice. Gil and Dennis had fixings for Italian sandwiches, along with salad and sides. It was a great spread. I have no idea what that is in that bag. I ended up chatting so much I never did get a serving of gumbo. I was slightly worried it might have been too spicy, but the rice helped defuse the heat. The pan was licked clean, so I must have done something right. Now if we could have kept on socializing it would have been swell, but with the food out of the way, it was time to open gifts. 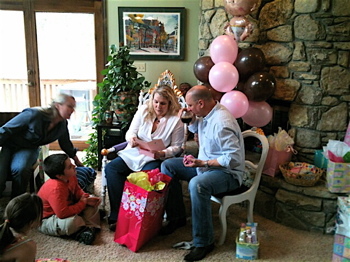 The music went down and Maia ascended to the pink throne – offered to the “mother of honor.” I gladly took the smaller chair to her left. That was one hot seat. 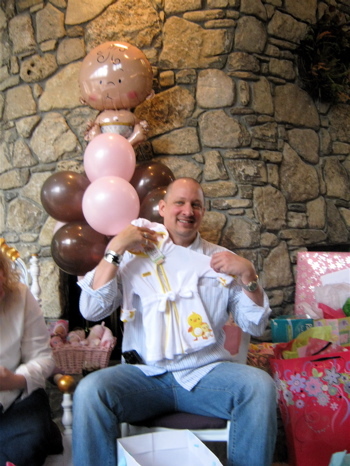 Little dresses, onesies with giraffe heads, lotions and shampoos, a baby recliner, towels, footed pajamas, a diaper genie, a crib – it’s all one big blur. Pause for a sip of Old Grand Dad. I can see my friends whispering lord knows what and laughing, cameras and cell phones snapping away. This went on for some time, but with the assistance of Old Grand Dad 114 I made it through. It was great in all seriousness. I was proud and felt blessed to be up there beside Maia, supporting her in what has been a sometimes daunting endeavor. Peanut's ducky robe is looking sharp on me. Much thanks to Dennis, Gil and the girls for opening their house up “again” to host the event – and to everyone in attendance who gave up part of their Sunday to join Maia and I in celebrating Peanut. I get this is a lot to take in at once, it is for us too, and it certainly has been for our families. After both mine and Maia’s looked at us slightly askance, and let out a nervous laugh, they’ve been nothing but loving and supportive, which I can’t thank them for enough. Maia and I have always had love for one another. It took some twists and turns for us to find each other again, but we’re both stronger for having gone through it together. I have mad-respect for the grand responsibility she has of parenting her two boys, and the one we shall share with Isabella Naomi. Gabe and Jacy are both nurturing souls, and have been practicing to care for their baby sister. Jacy has been puffing out his chest in anticipation of stepping into a “big” brother role. We can’t wait to see these two in action. Thanks again to all our friends and family. Your care and generosity is most appreciated. Being I’m 45 and trying fatherhood for the first time – anything that makes the first few months go smoother is a welcomed asset. I’m not sure what the over/under might be on finding happiness ever after, but do yourself a favor in the betting pool, take the over. Maia, Jacy, Gabriel and I are good, and we can’t wait for Isabella’s arrival tomorrow. This entry was posted in Events, Family, Food. Bookmark the permalink.